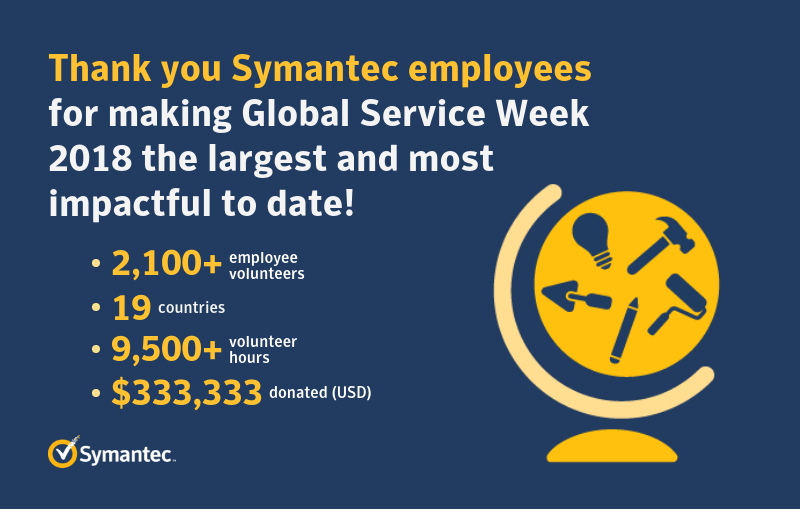 In Ireland, 156 Symantec employees volunteered a total of 1021 hours – an average of 6.5 hours per person! We were thrilled to see so many of our Ireland employees get involved; 29 percent of our employee base in Ireland participated. On the morning of October 17, 2018, 57 Symantec employees from Dublin worked with two different nonprofit organizations — An Taisce’s Clean Coasts and BirdWatch Ireland. While working with Clean Coasts, an organization that engages communities in the protection of Ireland’s beaches, seas and marine life, the volunteers removed 55 bags worth of litter and plastics from the beaches of and water surrounding Bull Island (pictured above). Additionally, the volunteers helped catalogue the debris to make sure that the source of pollution could be identified. We work hard to attract and retain talented employees and we’re committed to building a culture that enables our people to apply their time and talents to the issues they care most deeply about. Global Service Week is one of the many ways we are working to meet our goal to reach an average of four volunteer hours per employee by 2020. We promote nonprofit board service, plan quarterly volunteer events at our largest offices, and encourage employees to volunteer year round. Symantec supports these efforts financially with our Dollars for Doers program, donating $15 for every hour of volunteer service that an employee contributes, up to $1,000 per year.